Alumni Love: Care Packages Are On Their Way! On November 17th, Alumni Relations Manager Nisa Conway and a group of dedicated alumni parents prepared 150 care packages for alumni in the classes of 2014 and 2015. 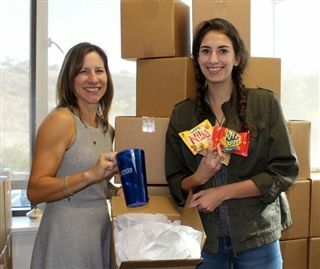 The packages, filled with tasty treats, finals essentials and Pacific Ridge tumblers, will arrive just as the college freshmen and sophomores tackle final exams and papers. Thank you to the parents who helped send this sweet reminder of home to our most recent graduates.